Pandapower provides an interface for AC and DC optimal power flow calculations. In the following, it is presented how the optimisation problem can be formulated with the pandapower data format. We highly recommend the tutorials for the usage of the optimal power flow. The equation describes the basic formulation of the optimal power flow problem. The pandapower optimal power flow can be constrained by either, AC and DC loadflow equations. The branch constraints represent the maximum apparent power loading of transformers and the maximum line current loadings. The bus constraints can contain maximum and minimum voltage magnitude and angle. For the external grid, generators, loads, DC lines and static generators, the maximum and minimum active resp. reactive power can be considered as operational constraints for the optimal power flow. The constraints are defined element wise in the respective element tables. The active and reactive power generation of generators, loads, dc lines and static generators can be defined as a flexibility for the OPF. Defining operational constraints is indispensable for the OPF, it will not start if contraints are not defined. The defaults are 100% loading for branch elements and +-0.1 p.u. for bus voltages. The cost function is specified element wise and is organized in tables as well, which makes the parametrization user friendly. There are two options formulating a cost function for each element: A piecewise linear function with $n$ data points. index (int, index) - Force a specified ID if it is available. If None, the index one higher than the highest already existing index is selected. costs for reactive power can only be quadratic, linear or constant. No higher grades supported. index (int, None) - Force a specified ID if it is available. If None, the index one higher than the highest already existing index is selected. Please note, that polynomial costs for reactive power can only be quadratic, linear or constant. 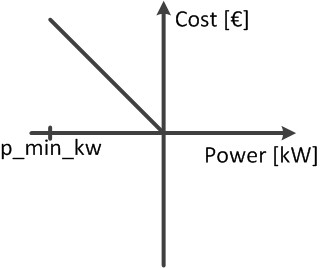 Piecewise linear cost funcions for reactive power are not working at the moment with 2 segments or more. 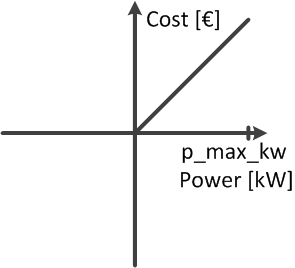 Loads can only have 2 data points in their piecewise linear cost function for active power. 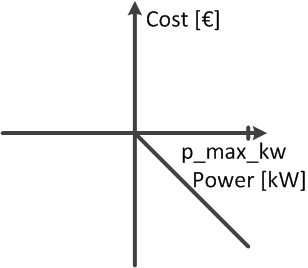 Active and reactive power costs are calculted seperately. The costs of all types are summed up to determine the overall costs for a grid state. It is a straight with a positive slope, so that the cost is zero at p_min_kw and is at its maximum when the generation equals zero. Please note, that the costs of the DC line transmission are always related to the power at the from_bus! Runs the pandapower Optimal Power Flow. Flexibilities, constraints and cost parameters are defined in the pandapower element tables. How these costs are combined into a cost function depends on the cost_function parameter. If set to True, warnings are disabled during the loadflow. Because of the way data is processed in pypower, ComplexWarnings are raised during the loadflow. These warnings are suppressed by this option, however keep in mind all other pypower warnings are suppressed, too. 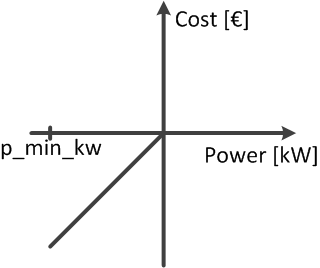 “On the Computation and Application of Multi-period Security-Constrained Optimal Power Flow for Real-time Electricity Market Operations”, Cornell University, May 2007. H. Wang, C. E. Murillo-Sanchez, R. D. Zimmerman, R. J. Thomas, “On Computational Issues of Market-Based Optimal Power Flow”, IEEE Transactions on Power Systems, Vol. 22, No. 3, Aug. 2007, pp. 1185-1193. R. D. Zimmerman, C. E. Murillo-Sánchez, and R. J. Thomas, “MATPOWER: Steady-State Operations, Planning and Analysis Tools for Power Systems Research and Education,” Power Systems, IEEE Transactions on, vol. 26, no. 1, pp. 12-19, Feb. 2011.